Beachworkers at the bathing establishment Neptunus on the beach in front of the Hotel D’Orange which was built in 1879 at the start of the Boulevard de Favauge. This elegant hotel was 2 storeys high and very wide and was a striking, regal-looking building with four dome-shaped towers, two on the land side and two on the sea side, each provided with belvederes. 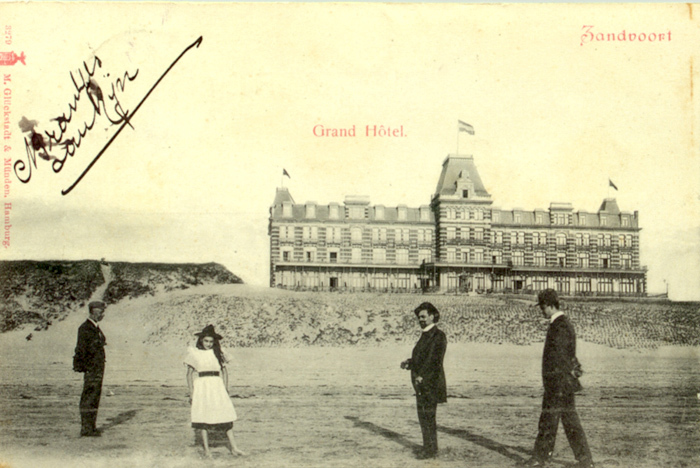 Beachcombers posing for a photo in front of the Grand Hotel. The Grand Hotel was the most famous hotel on the Boulevard Barnaart at the end of the 19th century. The name Barnaart refers to Willem Philip Barnaart who, in 1824, had succeeded Paulus Loot’s descendants as chief landholder of Zandvoort. 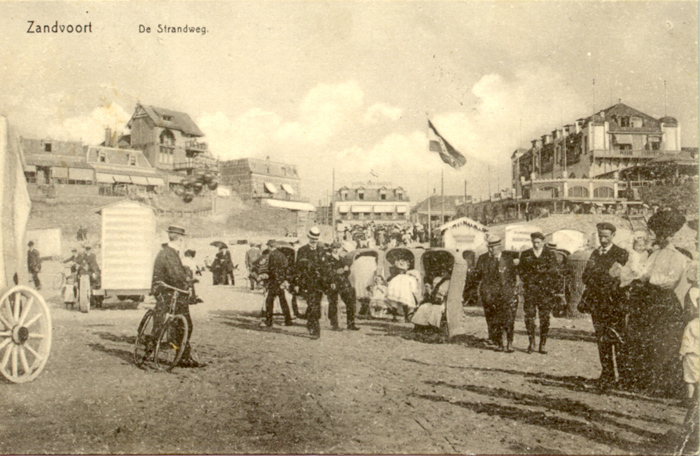 Holidaymakers down on the Strandweg circa 1905. 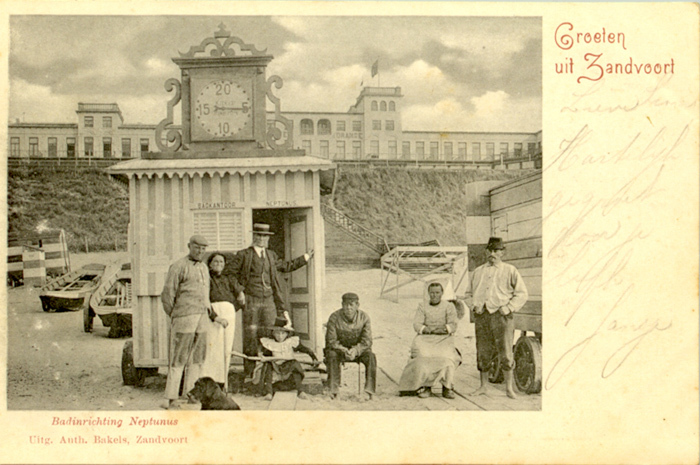 The Hotel Driehuizen (centre back) was one of the earliest of the famous hotels to be built in Zandvoort. It stood at the top of the Kerkstraat and attracted chic visitors from all over Europe. It was accessed by a narrow entrance from the Kerkstraat side and provided 14 luxury rooms, a drawing room and a restaurant. The Kurhaus had been seen since the 18th century in spa towns. It would have grand rooms for meeting and socialising, musical concerts and would have hosted ball evenings. 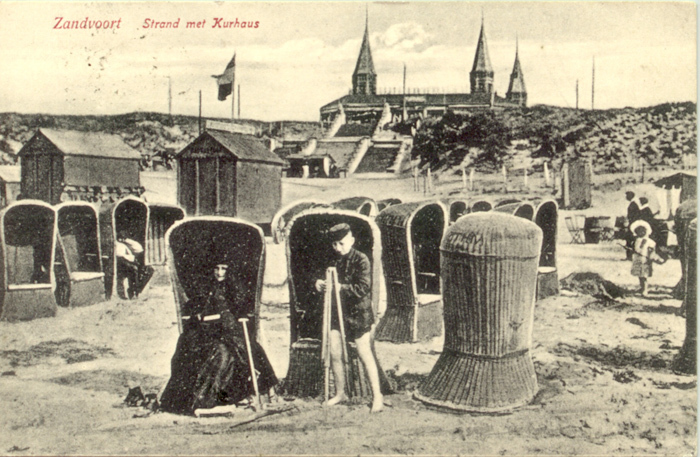 During the course of the nineteenth century it made its grand entrance into the life of the burgeoning seaside resorts such as Zandvoort. 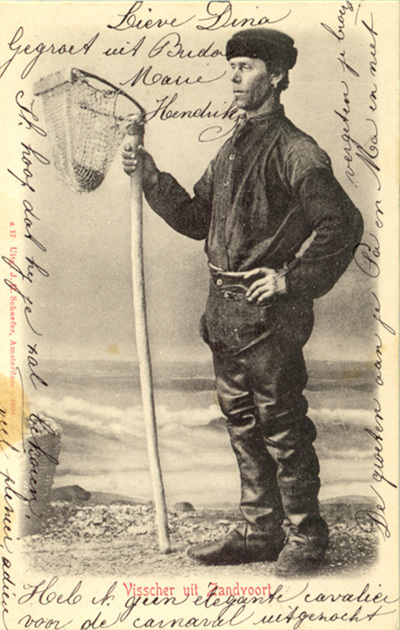 Traditional Fisherman circa 1900. By the look of this old photograph, this man clad in waders was probably a cockle fisherman. 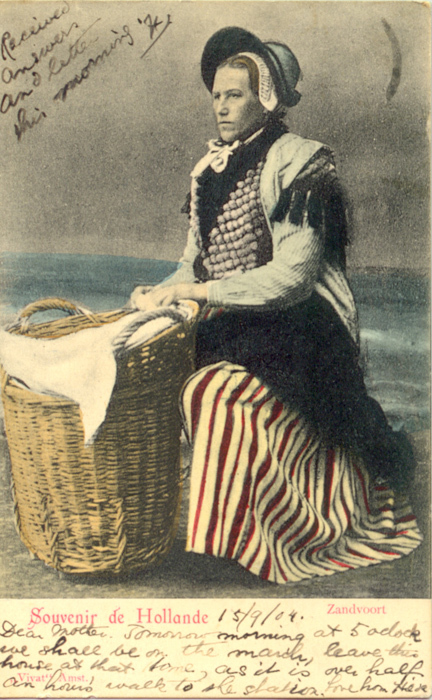 A traditional Zandvoort Fisherwoman circa 1905.